Open offices are not a new invention. They have been around for a long time as hallmark of start-up companies that simply cannot afford glitzy corporate skyscrapers with plush corner offices (yet). Open offices emerged less by deliberate design than driven by need. Start-ups typically run on a vibrant culture of passionate people wanting to spend time together to create something great, everyone works together closely in the tight space available. Information flows fast and freely. Recreational elements and other services offered remove the need or motivation to leave. Employees hang out to work maximum hours as a team in a fun, inspiring and supportive environment. Productivity is up and work gets done. Large companies are attracted by this powerful value-proposition for open offices – or so it seems. Mature organizations struggle with their increasing size that, over time, entails increasing specialization and complexity with a stifling system of red tape and inertia. While jobs are large in small companies and come with broad scope and high accountability, which are diluted when jobs narrow in large companies by increased specialization over time. Functional silos emerge and sub-optimize often to the detriment of other business functions. 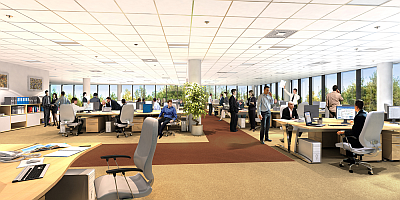 The reasons for large organizations moving to an open floor plan are often glorified and communicated as a measure to increase creativity and productivity in an appealing modern working environment: employees connect casually and spontaneously at the ‘water cooler’ to network and innovate together again. The true and paramount driver for tearing down the office walls, however, is often more sobering: it comes down to simply cutting costs by reducing the expensive office footprint. Fitting more people into less space comes at a price for the workforce. Cost savings only get you so far. It’s an easy approach but not a sustainable business model for productivity. What do you really save if productivity goes down? How sustainable is your business then? Sacrificing productivity for cost savings is a narrow-minded approach lacking long-term perspective and, therefore, not worth it. That is unless your goal is to achieve short-term gains without consideration for the future of the business, which is a disqualifying business perspective altogether. The popular phenomenon in large companies is a move for the wrong reasons (the better driver being increased productivity) and entails serious consequences that jeopardize the company’s productivity, workforce satisfaction, and even the bottom line. It gets even worse when the new environment is retrofitted space with structural limitations, founded in the legacy of existing buildings and investments, and if no flanking measures taken to enable effective collaboration needs. A design from scratch has the potential support the collaboration needs and flow of the workforce best. This is an advantage start-ups have when they can shape and rearrange loft space to their immediate needs without limitations carried forward. Controlling cost is necessary and reducing office footprint is an effective business measure. Aetna, for example, has nearly half of their 35,000 employees working from home already, which saves ~15% to 25% on real estate costs – that’s about $80 million saving per year. Do not get me wrong, there are undeniable benefits to open office spaces – when applied for the right reasons in the right context, with right priorities and proper execution. The point I am making is that cost reduction alone is not a worthwhile driver if it sacrifices productivity. There comes a point where a hard decision has to be made and if you prioritize cost savings, you sacrifice productivity and other aspects automatically. Unfortunately, the start-up company model with open office space and its agile and enthusiastic does not scale for large organizations. The corporate one-size-fits-all approach does not do the trick for several reasons. Proximity favors who needs to work together closely. 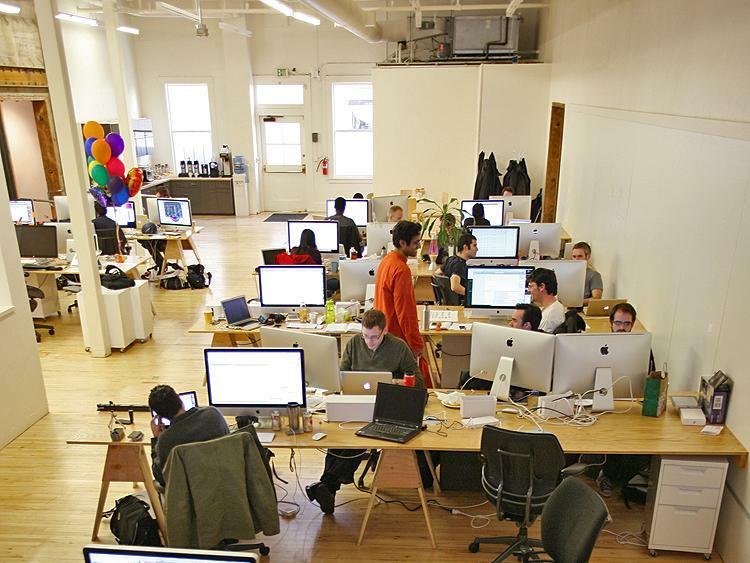 In a start-up company, staff is few and jobs are big. This ratio flips in large organizations where many employees work in highly specialized functions. With increasing specialization comes complexity that leads to functional silos. The employees become separated by every rising departmental and organizational walls. In large organizations, work space is typically paid for by department and charged to cost centers. Staff gets corralled this way and kept separated in functional clusters that are easier to administer but counteract productivity, streamlined workflow, and diverse collaboration cross-functionally. After all, it wouldn’t make sense to have any department operating completely independent from the rest of the organization. These artificial and structural boundaries make no sense (unless you are an accountant, perhaps). Therefore, trade the urge for financial micro-management for what makes the workforce more productive, as this is the most important aspect of collaboration and, ultimately, the bottom line. Make it easy for your employees to go the extra mile. Now here is where large companies can learn from how start-ups: offer incentives for employees to hang out and remove reasons for them to leave to maximize time to work and collaborate. The list seems endless: free beverages and food, services such as laundry, hair dresser, spa or receiving deliveries, exercise equipment, healthy snacks, child and pet care, and other useful perks that cost-cutting companies often omit. Sounds like a waste to many large companies. But is it really? You get more out of your employees’ carefree working along longer than by pinching the free coffee and have them leave during the day or early to run their necessary errands. It may sound counter-intuitive but when cost saving rules, the open office space often only works when not all employees are around at the same time. If all employees showed up on the same day there may not be enough room and resources (seating, access to power and networks, etc.) to fit and accommodate everyone, since the physical office footprint is now too small ‑ a Catch-22. When only a subset of employees can be present in the office at any given workday, the rest has to work remotely forming an –at least- virtual organization. Consequently, the random personal connection “at the water cooler” becomes less likely as does spontaneous cooperation by “pulling together a team” since your pool of physically available staff is limited. Management needs to take deliberate and determined measures to level the playing field for remote workers by giving them the same opportunities as colleagues present in the office. Why? “Out of sight, out of mind” is a powerful and human nature. If not managed effectively, it only becomes worse when remote staff easily is continuously overlooked when it comes to projects staffing, development opportunities and promotions, for example. The resulting inequities undermine workforce cohesion, effectiveness, and talent development. Read more on virtual teams at Why virtual teams fail, and how to make them work (part 1) and How to make virtual teams work! (part 2). FastCompany recently came up with a list of reasons by workers arguing against open offices, which is a good indicator where the pain-points are. Representative or not, the list tends to resonate with people that experienced first-hand working in a corporate open office environment. Workflow obstacles – competing over quiet spaces, conference rooms or other rare resources; no place to store personal items or personalize the space. One size does not fit all and it does not do the trick for large companies, in particular. So if you have to downsize office space or accommodate more employees, take a sound and sustainable approach by making productivity the driving priority and not cost. After all, we are human beings that work best when we have control over our work environment and schedule. When we perform at our best, it is also for the better of the company as a whole. Flexibility, empowerment and inclusion go a long way – otherwise, mind FastCompany’s warning: “What was supposed to be the ultimate space for collaboration and office culture was having the opposite effect” – also for the bottom line. Previous Previous post: Join me in Boston for the Corporate Venturing in the Life Sciences conference this week!